Edgar Crespo competes on the TCU’s official NCAA swimming & diving team and represents his home country of Panama, as well. He even competed in the Olympics last summer. Athletes dream of days like this. To reach the top of their game. Compete for their country. Claim a gold medal. Unfortunately, all of these achievements cannot often be accomplished for athletes. There are a few people who take on America’s topmost national competition and the world’s toughest international competition. 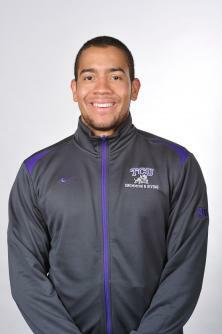 But that’s the life of TCU fifth-year breaststroke swimmer Edgar Crespo. Now in his fifth year, Crespo cannot compete for TCU due to NCAA regulations. However, he continues to practice with the team despite the fact that he swims for his home country of Panama, as well. He even competed in the Olympics last summer. Crespo’s climb up the proverbial swimming ladder in Panama is an unusual one. He started swimming when he was eight years old because his mom wanted him to. She made him take lessons just to get use to the idea of swimming. He said he did not really want to do it, especially after he realized he was allergic to the chlorine in the water. As he began to swim more often, Crespo said he began to like it more and more. He said he eventually started to focus on swimming after he realized how much more he could travel if he swam rather than playing another sport. “I like [swimming] more in that aspect than soccer,” he explained. Crespo said he typically shared his Panamanian team schedule with his TCU coaches. From there, he lays out a schedule of his travel and plans accordingly. There are some minor tournaments and meets that Crespo does not go to if his TCU coaches do not want him to, but Crespo said he’s never had a conflict that was that unsolvable. In most cases, Crespo said his international competition did not get in the way of competing for TCU. But from time to time, he has hit some bumps in the road. A memorable moment is when he swam in a tournament overseas for Panama two days before a TCU meet against Wyoming in Fort Worth, he said. After the meet for the Panama team was over, Crespo headed to the airport. He found out his flight was cancelled due to weather. By the time he was able to fly, it was the day of the TCU meet. Crespo said he arrived in Fort Worth the morning the meet started, and somehow was able to win three events for the school. Crespo said his coaches were still proud of him and allowed him to continue to compete for Panama even after tricky instances like that. He said he carries the TCU brand and name along with him when he competes, which he thinks gains international attention for the university. Crespo hopes to graduate in December with a degree in international marketing. After school, he would like to continue swimming, own his own business or even continue his studies. But where are his sights set in 2016? A gold medal in the Rio de Janeiro Olympics.